General Electric doesn't need a full recovery in its power business to drive huge gains for GE stock over the next several years. On Oct. 1, General Electric (NYSE:GE) ousted CEO John Flannery after barely more than a year on the job. New CEO Larry Culp had been enormously successful leading a smaller industrial conglomerate, Danaher. For many investors, the hope that he could turn things around seemed to outweigh the fact that GE issued a profit warning at the same time. As a result, GE stock flew 9% higher that day. General Electric stock performance. Data by YCharts. However, nearly all of General Electric's problems revolve around its struggling power business. The main drivers of GE's long-term value remain intact. The next year will likely have its share of bumps, but GE stock is poised to rebound dramatically within a few years. As I've previously noted, the pending merger and spinoff of GE's transportation division and the planned spinoff of its healthcare unit will give shareholders big windfalls. First, GE will sell some of its rail-related assets to Westinghouse Air Brake Technologies (NYSE:WAB) -- also known as Wabtec -- for $2.9 billion. The rest of GE Transportation will then merge with Wabtec. GE will (temporarily) hold a 9.9% stake in the combined company, while GE shareholders will receive a 40.2% stake in the new Wabtec. Wabtec stock has retreated recently, but the ownership stake that will be distributed to investors is still worth more than $0.75 per share of GE stock. Later in 2019, General Electric plans to spin off its healthcare division into a separate publicly traded company; GE shareholders will get an 80% stake in the business. Separating the healthcare division from the rest of the company's struggles should help it achieve a strong valuation. In fact, the spinoff could be worth about $4 per GE share. As of now, it's not clear what GE intends for its stake in Baker Hughes, a GE Company, which is currently worth about $2 per GE share. But even if none of it is spun off to shareholders, the other two spinoffs could be worth up to $5 per share, accounting for nearly half of GE stock's current price. At least two GE businesses will soon be spun off to shareholders. Image source: Getty Images. Even with all the value that shareholders are set to receive from GE's spinoffs, it wouldn't make sense to hold GE stock if the rest of the conglomerate was just junk. However, GE's aviation division -- by far its most valuable business -- is staying put. Last quarter, GE Aviation logged another tremendous performance. Revenue jumped 12% to $7.5 billion, while segment profit skyrocketed 25% to $1.7 billion, despite a temporary profit headwind from shifting production toward LEAP-series engines at GE's CFM joint venture. Year-to-date, GE Aviation's revenue is up 11% to $22.1 billion and segment profit has surged 19% to $4.7 billion. Order activity has run well ahead of revenue, at $26.8 billion. That points to plenty of revenue growth in the coming years. Indeed, GE's aviation business is riding the rising tide of global air-travel demand. Its CFM joint venture supplies the only engine for Boeing's 737 MAX and the more popular engine option for the Airbus A320neo family. Both aircraft manufacturing giants are quickly boosting production of those models to new records -- and they still can't keep up with demand. Some analysts seem to fear that the cyclicality of the aviation industry could soon put a stop to GE Aviation's revenue and profit growth. That seems very unlikely. Boeing and Airbus both have massive backlogs that will limit their need to cut production even if order activity drops off. Moreover, engine suppliers like GE make their profit on spare parts and services provided after the initial engine deliveries. Thus, revenue and profit should continue rising at GE Aviation for years after any downturn in aircraft demand. As a result, GE Aviation's segment profit is on track to roughly double by the mid-2020s. 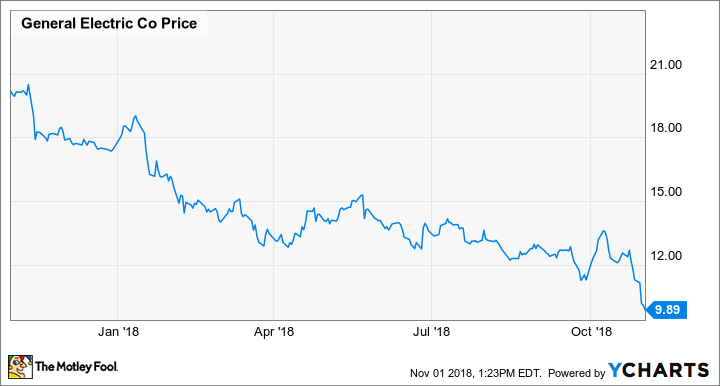 At a high level, GE stock has lost half of its value over the past year, because strong profit growth in its aviation division has been more than offset by rapid profit erosion in the power business. GE Power recorded an ugly loss last quarter, and its year-to-date profit of $64 million is down 97% year over year. In theory, there could be even more downside for the power business, and it could lose money indefinitely. However, new CEO Larry Culp is moving swiftly to cut costs and speed decision making, highlighted by GE's recent announcement that the power business will be split into two units: one focused on gas power, and one dealing with everything else. If GE can stabilize its power businesses at a modest level of profitability, that would already represent an improvement over 2018. Including the profit growth from GE Aviation, the result would be a huge surge in profit for the company as a whole. GE stock is currently priced for disaster. But over time, the aviation segment's profit growth is likely to far outweigh any further problems in GE's power business, as well as potential liabilities at GE Capital. As a result, I plan to continue accumulating GE stock. From this point, it won't take much of an improvement in the business to drive big gains for long-term shareholders.